The ICANN-process for the introduction of New Top Level Domains is continuing. 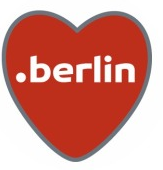 The Berlin-Domains are at the Live Period since 14th February 2014. The registry will release about 16,500 Berlin-Domains that correspond to street and place names in Berlin on 9th December 2014. It's your chance to get a piece of Berlin. "First we take Manhattan, then we take Berlin...."
You can pre-register here your name at the Berlin-Domain. The pre-registration for the General Availability Period is free, but compulsory. If we successfully register your domain, you will have to pay the domain fee. The Berlin-Domain costs 60 US-Dollar per domain and year. Not only the capital of Germany is called Berlin. Many cities in the world are named Berlin. All inhabitants of towns named Berlin might be interested in registering Berlin-Domains. "I am a Berliner" is a quotation from a speech made in the year 1963 by U.S. President John F. Kennedy in the Western part of the then devided Berlin. If you are a citizen of one of the Berlins below in US or elsewhere, you could also proudly say:" I am a Berliner". If you are an inhabitant of Berlin and want to get a Berlin-Domain, you can order it below.